Nantong lying in eastern Jiangsu, Nantong is the first port city at the estuary of the Changjiang River, an important distribution center of commodities in the Changjaing River Valley, and the birth place of China@,@s textile industry. 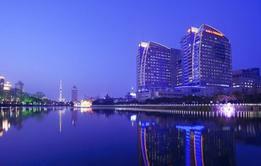 There are Langshan Hill, Nanjiao Park, Nantong Museum, the Museum of Textiles, and other tourist attractions. Overlooking the Changjiang River, Langshan Hill together with Junshan and Jianshan hills to its east and Ma@,@an and Huangni hills to its west are collectively called the five hills. Standing on top of Langshan Hill, one may have a panoramic view of the surrounding scenery with water extending to the horizon. The main scenic attractions include the Great Sage Hall and the Faru Hall.